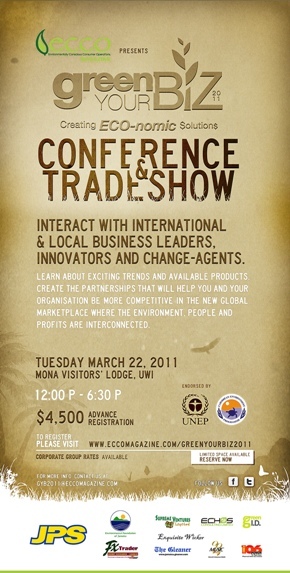 On March 22, 2011, E.C.C.O Magazine, Jamaica’s leading eco-friendly lifestyle publication, will host “Green Your Biz 2011: Creating ECO-nomic Solutions” at the University of the West Indies’ Mona Visitors’ Lodge. The inaugural conference will feature organisations that are leading the way in corporate and social responsibility while adopting ways to make them more competitive in the new global marketplace where the environment, people, and profits are interconnected. Over 200 people are expected to attend the Conference and Trade Show and will interact with international and local business leaders, innovators, and change-agents committed to profitable sustainability and successful green strategies. – Safi James: green I.D.